Whether in a vehicle looking to find the nearest gas station, or on a factory floor needing to stop the production line, it is easy to imagine ways in which conversation-based interactions can enhance experiences and increase productivity. We’re evolving from a world where humans have had to learn and adapt to computers to one where computers are learning how to understand and interact with humans in a more natural way. 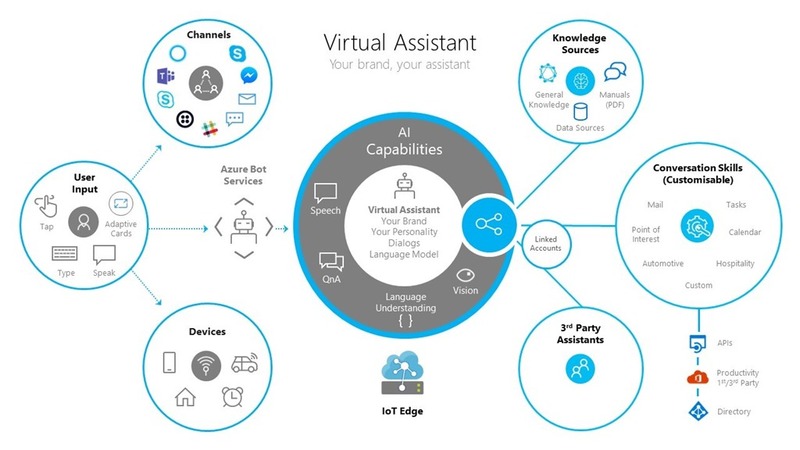 Azure Bot Service helps developers build, connect, deploy, and manage intelligent bots to interact naturally with users on websites, apps, Cortana, Microsoft Teams, Skype, Slack, Facebook Messenger, and more. With over 360,000+ registered Azure Bot Service developers, we are constantly improving our tools and framework to make them more productive. Today, we’re announcing the preview of an open source bot solution accelerator for virtual assistants. This solution accelerator simplifies the creation of branded virtual assistants, enabling developers to get started in minutes. Additionally, the Bot Framework software development kit and Tools version 4.1 is generally available, enabling developers to be more productive with bot development. Finally, Microsoft has signed an agreement to acquire XOXCO, a software product design studio most known for its conversational AI and bot development capabilities. We have seen a significant need from our customers and partners to deliver a conversational assistant tailored to their brand, personalized to their customers, and made available across a broad range of conversational applications and devices. We believe all organizations should have the ability to build branded virtual assistants. We have taken best practices developed while working with partners to develop their own assistants and, in continuing with Microsoft’s open source approach for bot development, have made this solution accelerator for virtual assistants available on GitHub, allowing for full control over the end user experience built on a set of foundational capabilities. Additionally, the experience can be infused with intelligence about the end-user and any device/ecosystem for a truly integrated conversational experience. The scope of this functionality is broad, typically offering end users a range of capabilities. To increase developer productivity and enable a vibrant ecosystem of reusable conversational experiences, we are providing developers initial examples of reusable conversational skills. These skills can be added into a conversational application to light up a specific conversation experience, such as finding a point of interest, interacting with a calendar, tasks, or email, with more to follow. Skills are fully customizable and consist of language models for multiple languages, dialogs, and code. For more information on getting started, please read our Virtual Assistant documentation. The Bot Framework Emulator V4 simplifies integration and management of the different services that are part of a conversational experience. Developers can directly log into Azure and open and manage Cognitive Services commonly used to create conversational experiences such as: Language Understanding (LUIS), and QnA Maker. Learn more on GitHub. The Web Chat control offers a quick way for developers to integrate their bots into existing websites. Web Chat V4 offers developers ability to fully customize the chat window, including ability to change colors, padding, sizes, and to brand the window with custom graphics and logos. To read more, please visit our blog post on the Bot Framework SDK and tools 4.1 release. We are also excited to share that Microsoft has signed an agreement to acquire XOXCO, a software product design and development studio known for its conversational AI and bot development capabilities. The company has been paving the way in conversational AI since 2013 and was responsible for the creation of Howdy, the first commercially available bot for Slack that helps schedule meetings, and Botkit, which provides the development tools used by hundreds of thousands of developers on GitHub. Over the years, we have partnered with XOXCO and been inspired by this work. With this acquisition, we are continuing to realize our approach of democratizing AI development, conversation and dialog and integrate conversational experiences where people communicate. We’re excited to welcome the XOXCO team and look forward to working with the community to accelerate innovation and help customers capitalize on the many benefits AI can offer. For more information, please see our blog post announcement.